The feast day of St. Augustine of Hippo is August 28. St. Augustine was born in Tagaste, on November 13, 354, in a northern African region of farms and olive trees. His pagan father, Patricius, was a city official with little money, who wanted Augustine to have a good education. His mother, Monica, was a devout Catholic. She wept to God on his behalf, Augustine later said, "more than mothers are accustomed to weep for the bodily deaths of their children." Augustine studied rhetoric in Carthage, and later taught rhetoric in Carthage, Tagaste, Rome and Milan. While in Milan, he began to listen to the sermons of its Bishop Ambrose. Augustine's Confessions recount his extensive philosophical analysis of Christianity as well as Platonism, astrology, and Manichaeism in his early adult years. From the age of about 15 to 30, Augustine lived with a woman from Carthage. His son was born during that time. However, when Augustine decided he wanted to be married, he did not consider his mistress to be a suitable wife under the standards of his day. He then became engaged to marry a young girl, too young to legally marry. His mistress left and returned to Africa, and Augustine took another mistress. Ultimately, his good friend Alpius talked him out of the engagement. While Augustine considered Christianity, he prayed, "Grant me chastity and continence, but not yet." In 387, torn between his perverse lifestyle and Christianity, Augustine received a visit from an African Christian named Ponticianus. Ponticianus described the life of Egyptian monk Abba Anthony of the Desert, and Augustine became greatly disturbed at himself for rejecting God's will. He flung himself under a fig tree and wept to God, asking "How long, O Lord? . . . . Why not this very hour make an end to my uncleanness?" Augustine then read from St. Paul's Epistles "Not in rioting and drunkenness, not in chambering and wantonness, not in strife and envying, but put on the Lord Jesus Christ, and make no provision for the flesh to fulfill the lusts thereof." (Rom. 13:13). Instantly, his doubt disappeared. His friend Alpius joined him in committing his life to the Lord. On Holy Saturday, 387, Augustine, his son, and his friend Alpius were all baptized by Bishop Ambrose. About one year later, Augustine gave up his teaching career and returned to Tagaste, Africa. There, he started a small ascetic community. In 391, he traveled to the African seaport of Hippo looking for one of his friends, and planning to find a place for a new monastery. He went to church, and as was then common, he was grabbed by the congregation during a sermon by bishop Valerius and forced to become a priest. In 395, Valerius consecrated him as coadjutor bishop. The Roman Empire culture was in decline, and corrupt Roman courts were no longer trusted by the public. Bishops like Augustine provided an alternative means of deciding civil cases. He often spent all morning, and sometimes the entire day, arbitrating cases. He wrote theology extensively, sometimes devoting every Saturday and Sunday night to his writing. In 397, he finished his book Confessions, the story of his conversion and highly analytical praise for God. In 15 years, from 395 to 410, he wrote 33 books and long letters. The extroverted Augustine kept his bishop’s house as a monastic community, living there together with most of his priests, all of them giving up worldly goods. He was seldom alone, and did most of his thinking out loud, talking through ideas with friends. His sermons were almost like dialogues with congregation, sometimes reducing his listeners to tears. Despite the decadence of fourth century Rome and the declining trust of the citizenry in the Roman judicial system, most of Augustine's life was lived in a time of optimism for the Church's future. He had lived through a rapid transition from a persecuted church to a church whose bishops were influential social figures in the community. In the late fourth century, that inspired such optimism that he thought the Church might eventually encompass all of human society. His orthodox views prevailed over the Donatists. Pagan shrines were closed in 399. However, Augustine did not see how fast the Western Empire was collapsing. On August 24, 410, Alaric's army of Goths entered Rome and sacked it for three days. Immersed in the ensuing crisis, the Roman government lost interest in Africa and its Church. Refugees from the beleaguered city streamed into Africa, and Christians became disillusioned. Another heresy appeared: Beginning in 411, Augustine struggled against the Pelagians, bringing him international recognition. On September 26, 426, the nearly 72-year old Augustine decided to resign his role as bishop. He nominated the priest Eraclius to be his successor. In the presence of his congregation, after announcing his resignation, Augustine sat down. Eraclius came forward and preached, “The cricket chirps, the swan is silent.” Augustine spent his last years in his library, editing and listing his writings for future generations. In 429 and 430, Vandals invaded northern Africa, and Roman rule of Africa collapsed. In August, Augustine fell ill with a fever, knew he was dying, and chose to spend his last days crying deeply in penitence. He died on August 28, 430. The Dark Ages he had not foreseen followed soon after his death. 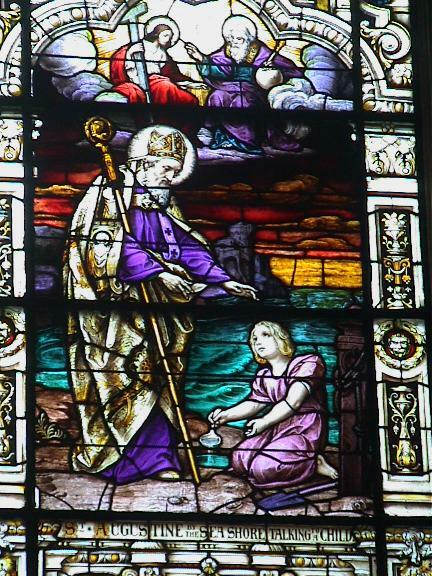 Stained glass window: From the Cathedral Parish of St. Augustine, Florida (photo). Your spelling Theresa intrigues me all the more, for it could be read al-pius "the reverent one." Perhaps Augustines friend gives us an indication of where the honorific for Christian pastors (commonly abbreviated Rev.) originated? If so, the name on the monument in China might simply mean Priest, not as I had surmised a proper name of the person himself. The fate of the syriac-liturgical Christians is certainly shrouded in mystery, a promising field for ecclesiastical anthropologists and archeologists. Pray for peace in the Middle East that our sacred heritage not suffer pillage and loss under violent conflicts (the Christian antiquities minister in Irag fled for his life just this week, so sad).